June 22, 2014 -- As is self-evident from the unfinished work at the northeastern corner of Sea Cliff and Roslyn Avenues, the area formerly known as Mini Plaza, is in the process of getting a facelift, and will be re-dedicated Lincoln Plaza, in honor of the President whose words promoting civic mindedness adorn the brick wall of the building there. 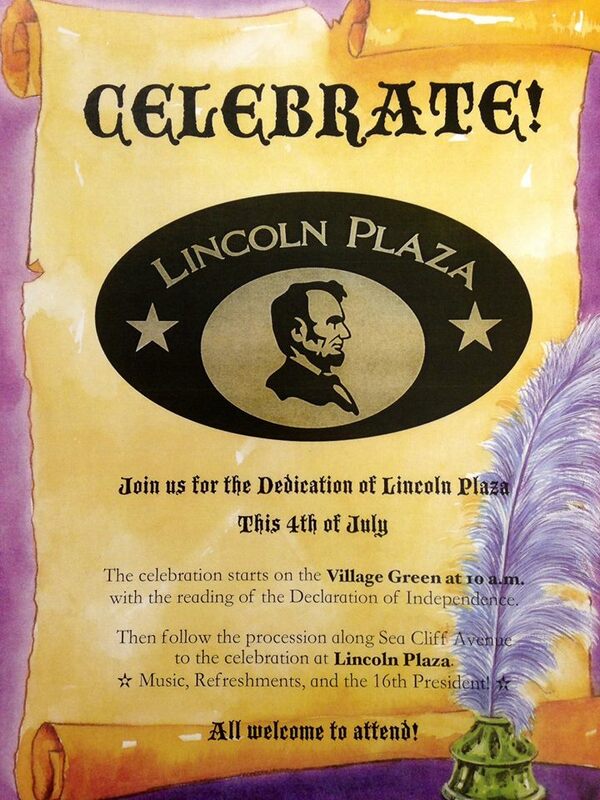 Following the annual July 4th reading of the Declaration of Independence on the Village Green at 10 am, celebrants will be led by resident Paul Haining, as he plays his bagpipes, up Sea Cliff Avenue to the corner of Roslyn Avenue where the dedication ceremony will take place. See article below for background on the Lincoln Plaza project. 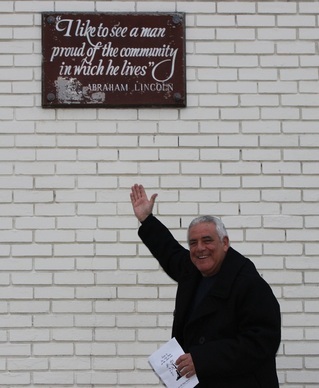 Original Post - December 16, 2013; reposted, June 22, 2014 -- As Village Trustee and self-described history buff Ed Lieberman explains it, he first noticed the simple plaque about eight feet up on the side of the building at the northeast corner of Roslyn and Sea Cliff Avenues when he first moved into the Village. It reads simply, "I like to see a man proud of the community in which he lives." -Abraham Lincoln. Two decades later, soon after he was elected to the Village Board, Mr. Lieberman was reading through the Sea Cliff Museum's "Salute to Sea Cliff's Parks and Other Public Areas," published in 1985, and was particularly struck by the blurb about the street corner known as "Mini Plaza." It describes the spot, with its "three red maples, . . . trellis with appropriate greenery, new brown shutters and a wall plaque encouraging civic pride . . . with awnings, planters, hanging baskets and summer café tables" as a "delightful spot to sit in the shade." "I had an epiphany," Mr. Lieberman said, and he approached Mayor Kennedy and the Village Board about refurbishing the corner. It now looks as if Mr. Lieberman's vision, as he puts it, "to enhance the beauty and charm of Sea Cliff by revitalizing a once cherished place in our beloved village," may soon become a reality as plans are now in the works for Mini Plaza to receive a facelift and be rededicated "Lincoln Plaza." Today, little of that description from the brochure remains, with only one maple still standing, the stump of another rotted out, and the trellis and tables gone. And while a planter there has been beautifully maintained by local floral designer Susan Campagna for the past four years, time has taken its toll on the street corner. If approved by the Village Board, the work will commence this spring. 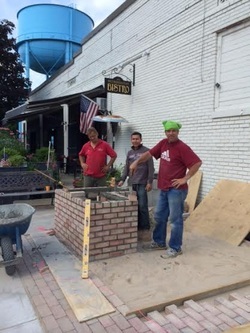 Local landscape designer Susan Giordano has already leant a hand with design, and landscape designers Billy and Rich Laderer have offered their time and effort to replace the concrete sidewalk slabs with attractive brickwork. A bicycle rack will be added and a sitting area with benches created. And, most importantly to history buffs, the beautified street corner will be re-dedicated "Lincoln Plaza," and on the wall, perhaps utilizing the windowless frames already there, will be inscribed the full, accurate, and far more meaningful Lincoln quotation: "I like to see a man proud of the place in which he lives. I like to see a man live so that his place will be proud of him."